Our mission was to create a nice Sunday dinner, using any cut of beef from the front of the animal. That means the cuts that are suitable for slow cooking, and we decided pretty fast to make a chili. This particular one evolved, and it's a great recipe, really. The coca-cola makes it quite sweet, so you have to add a lot of spice to make it balanced. In the end, it will be very aromatic, and matches perfectly with the slightly acidic tomatoes, the salty cheese, the crunchy chips and cool crème fraîche. It's also something you can prepare far in advance, no need to be in the kitchen as your guests arrive. And most of all, it's SO easy. I'm convinced absolutely anyone can make this! The chips are made from the lavash crackers both Dagmar and I made for the Daring Bakers challenge a while ago, and they're spiced with salt and ancho chili, or cayenne pepper. We use spelt wheat, but it won't make a big difference if you use regular all-purpose flour. If you don't feel like baking - just substitute bought nacho chips. It works nicely too. 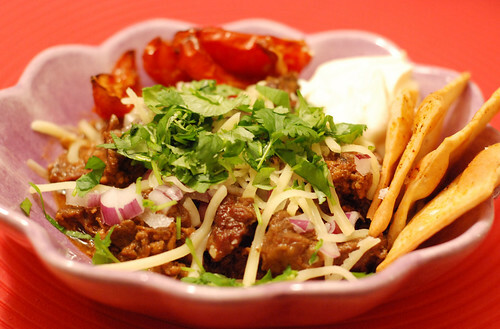 The chili itself uses three types of chili - fresh red, ancho and smokey chipotle. (If you're in Sweden, you should find chipotle paste from Santa Maria on the taco shelf in the grocery store, and ancho chili in powdered form from Santa Maria as well, among the other spices.) The oven dried tomatoes is something I've made before, and they're really yummy with this chili. They're really great with a smoked salt, but don't worry if you can't find it. Same with the white balsamic vinegar - it adds a lot of flavor, but regular white vinegar will still give you good results. Brown the meat, pork and onions in cooking oil in a large pot, in batches. Salt and pepper as you go along. Put everything back in the pot, along with the fresh chili, garlic, coca-cola, ancho chili, chipotle chili and cumin. Bring to boil, lower the heat and let the chili simmer under a lid for at least two but preferrably three hours. Check it every once in a while to make sure it doesn't dry out. If it looks like it might, add some water. Towards the end, taste it and season with more salt and spices as you need it. Add more water if it seems to thick, but if it's too liquid, stir in a little bit of corn starch. Mix salt, yeast, sugar, olive oil and water in a bowl. Add the flour and work into a supple dough. Knead very well - the more you work it, the easier it will be to roll out. Cover the dough and leave it to rise for about 90 minutes. Roll out the dough on a piece of parchment paper, as thinly as you can. You might need some extra flour. Score the dough into squares or diamonds, sprinkle with water and then with cayenne or ancho chili, and salt. Bake at 175°C for 15-20 minutes. Let the cool before you break them into separate chips, and be aware that they'll crisp up in a few minutes if you let them stand for a bit. They can be soft when they're still warm. Cut the tomatoes into wedges - six per tomato is about right. Place in an oven-proof dish, skin-side down, and drizzle with olive oil. Sprinkle with sugar, smoked salt and cayenne pepper. Bake at 150°C (preferrably in a convection oven) for about an hour. The tomatoes should look fairly dry, leave them in for a bit longer if you need to. When you do take them out of the oven, drizzle with the vinegar and leave to cool. Lycka till, jag håller tummarna för er. Good luck! I'll keep my fingers crossed for you!!!!! Sounds wonderful! Hope you do really well. Congratulations are in order!!!!! You won!!!!!!!!!!!! OMG that sounds incredible. I love the idea of the sweet cola and the spicy chillies.